I've been a fan of reptiles for as long as I can remember. As a kid, I used to search the local fields, woodland areas, and streams for any reptiles or amphibians I could find (didn't know about the term "herping" back then). I started keeping pet reptiles about ten years ago, but have only recently gotten into keeping day geckos. I received my first two giant day geckos (a male/female pair) yesterday. They are housed within a 55-gallon naturalistic vivarium. The substrate is organic potting soil covered with a layer of dried magnolia leaves. For climbing, there are multiple maple limbs propped at angles (collected from a pesticide-free location and baked the oven at 250 degrees). I have added tropical springtails and will later add giant orange Spanish isopods when their culture begins taking off. The plants include two mandarin plants (Chlorophytum amaniense), a pink nerve plant (fittonia), a Chinese money plant (Pilea peperomioides), a neoregelia "fireball," and two orchids. UVB is provided by an arcadia t8 bulb with 6% UVB and a heat bulb is placed over one of the maple branches for basking. I look forward to future discussions with everyone here. Geckos are an exciting hobby! 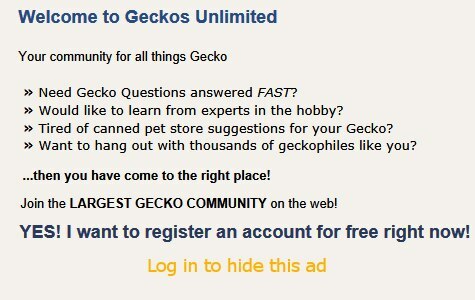 There are different genuses and species to please every geckophile.